Whether you’re hiking, hunting, or just trying to keep track of your fellow explorer, this is a great choice of two-way radio. 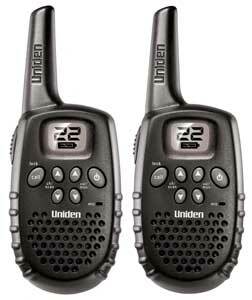 With a range of up to 16 miles, the Uniden GMR1635-2 radios are ready for most activities, and feature 22 channels (7 FRS / 5 GMRS), auto-squelch to reduce interference, channel scan and monitor features, and other convenient two-way basics like call tones and a roger beep. The package includes two radios, six AAA alkaline batteries, two belt clips, and printed materials. Use the radios when camping, hiking, hunting, or even for keeping in contact with another person in town. A call tone and roger beep helps you know when transmissions to and from someone are beginning or ending. The GMR1635-2 features both, and you can turn the roger beep off if you’d prefer. The GMR1635-2 is equipped with an automatic squelch system, which shuts off weak transmissions and unwanted noise caused by terrain conditions or reaching your your range limit. You’ll get the best range in areas without obstructions. Up to a 16-mile range. Manufactured in accordance with the RoHS standard. GMR1635-2 radios are powered by three AAA batteries, and features a unique circuit designed to dramatically extend battery life. If there are neither transmissions nor incoming calls for 2 seconds, the radio switches to Power Save mode. The radio is still able to receive transmissions in this mode. In addition, the radio features a battery strength meter, to show you when it’s time to charge. The GMR1635-2 radio boasts a channel scan feature that lets you easily scan all 22 channels (15 GMRS, 7 FRS). When an active channel is detected, the unit pauses on that channel until the channel is clear. After a two-second delay, the radio will continute scanning. Pressing the PTT (aka Push to Transmit) button while the scan is paused on a channel will allow you to transmit on that channel. Note that the GMR1635-2 radios operate on the General Mobile Radio Service (GMRS) frequencies, which require a Federal Communications Commission License to operate. For licensing information and application forms call (800) 418-3676 or (888) 225- 5322. No license is required for operating FRS channels 8-14 or any channel in Canada. To promote a cleaner environment, this product was manufactured in accordance with the RoHS standard, which limits the use of substances such as lead, mercury and cadmium. The minimized packaging is also 100 percent recyclable, and printed with non-toxic inks. Tagged (Pair), 16Mile, Battery, Black, Channel, FRS/GMRS, GMR16352, Radio, TwoWay, Uniden. Bookmark the permalink.